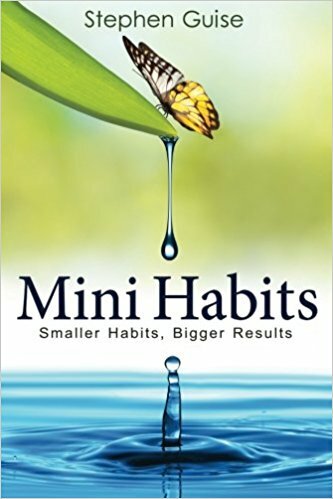 I would say it was Stephen Guise's book "Mini Habits: Smaller Habits, Bigger Results." The title sounds like one of those formulaic self-help books, of which there are hundreds. But this one's different. Guise has derived a somewhat counter-intuitive approach to building habits and tackling hard projects. He suggests that we fail in bringing about personal change because we set the bar too high. He proposes an alternate approach that at first sounds a little weird — build 'mini-habits', (ludicrously) microscopic versions of the habits or projects you want to adopt. He dwells deep into the psychological advantage of this technique, revealing why we fail and why the idea of 'mini-habits' practically guarantees success. I'm usually averse to self-help books that espouse trite productivity formulas; I avoid them like the plague. But this one came highly recommended, and to my surprise, the technique worked! I tried "getting motivated." It worked sometimes. Then one afternoon--after another failed attempt to get motivated to exercise--I (accidentally) started my first mini habit. I initially committed to do one push-up, and it turned into a full workout. I was shocked. This "stupid idea" wasn't supposed to work. I was shocked again when my success with this strategy continued for months (and to this day). I had to consider that maybe I wasn't the problem in those 10 years of mediocre results. Maybe it was my prior strategies that were ineffective, despite being oft-repeated as "the way to change" in countless books and blogs. You can succeed without the guilt, intimidation, and repeated failure associated with such strategies as "getting motivated," New Year's Resolutions, or even "just doing it." In fact, you need to stop using those strategies if they aren't giving you great results. They don't work because they all require you to fight against your subconscious brain (a fight not easily won). It's only when you start playing by your brain's rules and taking your human limitations seriously--as mini habits show you how to do--that you can achieve lasting change. A mini habit is a very small positive behavior that you force yourself to do every day; its "too small to fail" nature makes it weightless, deceptively powerful, and a superior habit-building strategy. You will have no choice but to believe in yourself when you're always moving forward. The barrier to the first step is so low that even depressed or "stuck" people can find early success and begin to reverse their lives right away. And if you think one push-up a day is too small to matter, I've got one heck of a story for you!